Fundraising, as we all know, is all about relationships. Bonds with Board members, connection to your mission, past or present relationship with what your organization does—all are keys to creating donors from prospects and prospects from strangers. Too often, however, we only look at the usual suspects: Schools look to current or past students; hospitals to people they served. Nonprofits who are focused on a disease look for those who have suffered, survived or were the loved one of someone who lost that particular battle. Social services look for people who have a warm heart. Beyond that, we look to our Board to open their rolodexes; donors to bring forward their friends. All those are fine ways to identify potential donors—but unless you are lucky enough to have a broad and affluent prospect pool, they may not be enough. You may need to get more creative in your prospecting. Otherwise bright and resourceful people seem to freak at the idea of looking for donors outside of their comfort zone. “Why would someone not already tied to our organization be interested in us?” seems to be the question du jour. “Why not?” I think—IF (and that is an if in capital letters) you’ve done something to tie them to you in some way, shape or form. Start easy: Invite them to an event and then (this is where it stops being easy) follow up and bring them closer (literally, if possible) to who you are. Maybe invite them to speak to your students, your clients or (gasp! 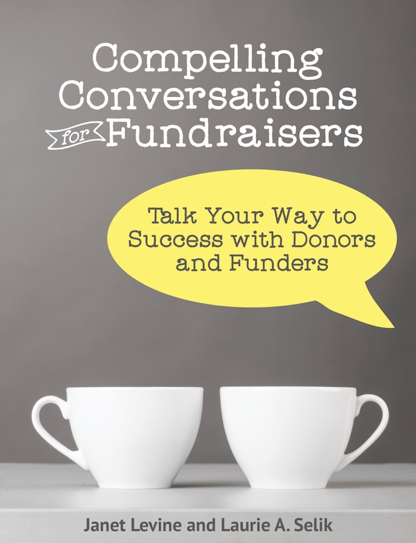 Here’s a thought for a philanthropic person) to your Board about yes, fundraising. Honor them in some way for what they’ve done in your city, town, neighborhood. Interview them for your newsletter. In short, find out who they are, what their interests are and figure out how to bring them a little closer to you and then, follow up and follow up some more. A friend just told me an amazing story: His CEO wanted to meet a famous and wealthy individual. My friend is not a fundraiser but is wonderfully connected in his community and by connecting a whole lot of dots he was able to reach this famous and wealthy person. He invited this person to be a keynote speaker at a small event they were planning (which they weren’t, but he figured they could), and in due time, this person came to the now for-real event and spoke. After the speech, he had lunch with the CEO and was enthusiastic about his reception and positive about the event. And then? Nothing. Nothing. The chief fundraiser said there was no reason to try to cultivate this person—he had no connection with their organization. And what, I ask you, was that keynote speech, the lunch with the CEO and the warm words? To make a long story short, one of the attendees of the event—the CEO of another nonprofit organization—contacted the rich and famous person to thank him for his speech and told him how much he enjoyed hearing his words. Over the next three months, this CEO periodically sent the man clippings, a newsletter, little things he “thought you might be interested in” as his handwritten notes always said. You know where this true story is going. Eventually, he invited this person to be the keynote speaker at one of his organization’s events and had the key people at his organization and the Board leadership seated at the luncheon table. Over the next several months, this famous and wealthy individual was introduced to many people in the organization and given up close and personal information about the work of the organization. Today, he is a major donor, and of equal importance, a mega-booster of this organization. These things happen—they do. But you have to work them and you have to believe that it is worth the time and the effort to truly tie someone to what you do. It doesn’t always start with an obvious connection. They may not—on the surface—care about your work or your organization. If it were easy, we’d all be doing it. But if instead of being sure that no one outside your circle could care, you start thinking about linkages and the many ways to bring someone inside your circle, you will be expanding your reach, increasing your capacity and meeting a whole lot of new people. This entry was posted in cultivation, development, development programs, prospecting and tagged cultivation, fundraising, prospecting. Bookmark the permalink. Any non-profit aiming to expand its individual donor base would be wise to follow your (surprisingly simple) advice. I am definitely taking note for my own organization! Thanks Dan. One of the interesting things of consulting is the number of times I think, “You know–I should have followed my own advice” when I worked full time for an organization!